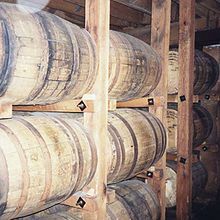 3 Whiskey made in Tennessee that is not "Tennessee whiskey"
Whiskey made in Tennessee that is not "Tennessee whiskey"
^ "Beginner's Guide to Bourbon and Tennessee Whiskey". pastemagazine.com. Retrieved 2018-09-23. ^ a b c "Jack Daniel denounces barrel legislation". Tullahoma News. Retrieved 2018-09-23. ^ "U.S. Bourbon and TN Whiskey Drive Export Records in 2013 – Distilled Spirits Council". www.distilledspirits.org. Retrieved 2018-09-23. This page was last edited on 2 April 2019, at 19:28 (UTC).